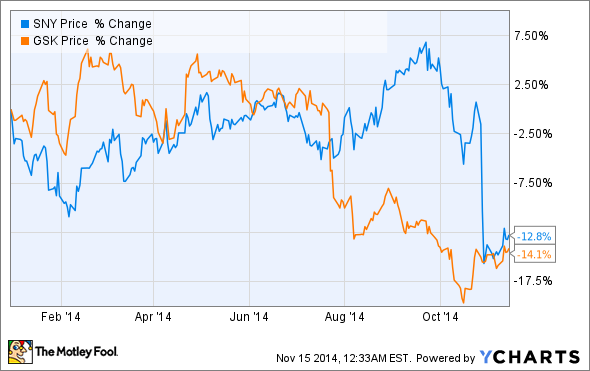 GlaxoSmithKline vs. Sanofi: Which Is The Better Dividend Stock? Shares of healthcare giants GlaxoSmithKline and Sanofi have fallen hard this year, resulting in unusually high dividend yields for these two companies. Here is a look at which company offers the better opportunity for income investors moving forward. Because dividend stocks can greatly amplify gains over time, they are an essential component of a well diversified portfolio. Choosing a set of dividend payers, though, can be challenging. For example, stocks that pay high yields may be doing so because of an underlying problem in the company's business, causing shares to crash and yields to subsequently rise. In such circumstances, the dividend may be at risk of either being drastically reduced or suspended altogether. Because neither company has reduced its dividend, however, they now sport two of the highest yields in the entire health care sector. Specifically, Glaxo currently offers investors a princely 5.36% yield, and Sanofi's 4.09% isn't far behind. With this in mind, let's take a deeper look at which company offers the most compelling investing opportunity moving forward. Glaxo's story centers mostly around the loss of exclusivity for its lung drug Advair, and the slow uptake of newer respiratory medicines like Anoro and Breo Ellipta due to payer issues. The recent patent expiration for its blockbuster Omega3 fish oil pill, Lovaza, also hasn't helped matters. Adding insult to injury, the company was hit with a nearly half billion dollar fine in China during the third-quarter as well, stemming from its high profile bribery case. Last but not least, the series of clinical setbacks in its high margin oncology unit over the past few years have set the company adrift when it comes to the search for major new drugs. All this bad news has forced Glaxo's management to shake things up in a huge way. Earlier this year, for instance, the company swapped its oncology unit for a portion of Novartis' (NYSE: NVS) vaccine portfolio, and is now reportedly engaging in talks to sell off a large chunk of its legacy product portfolio. Per the third-quarter conference call, Glaxo is also exploring an IPO for its HIV joint-venture ViiV Healthcare, one of the few areas of high growth remaining in the company's product line. Unlike many of its peers, though, Glaxo has no intentions of buying its way out of this mess through a major acquisition. Management has repeatedly stated that they are focused on organic growth, and inking smaller research deals with other companies. All told, there are a lot of moving parts with Glaxo right now, making it hard to tell how this will ultimately play out. Sanofi isn't exactly in an enviable position, though. The company recently fired its CEO Chris Viehbacher for dubious reasons, despite a more than respectable track record during a difficult period in the company's life cycle. Perhaps most importantly, Viehbacher inked new research deals with the likes of Regeneron (NASDAQ: REGN) during his tenure that gave birth to the highly anticipated cholesterol drug alirocumab. His purchase of Genzyme in 2011 has also been a huge win for the company. Without Genzyme's high growth orphan drug portfolio, Sanofi would most definitely be much worse off than it is today. Even more concerning is the looming patent expiration for Lantus -- Sanofi's long-acting insulin that presently accounts for nearly a quarter of total revenue. Lantus's patent is set to expire next February, and it's highly uncertain whether its successor, Toujeo, can pick up the slack. The foremost problem is that Eli Lilly (NYSE: LLY) and Novo Nordisk (NYSE: NVO) are both racing to develop competitors that could reach the market as soon as 2016. Some industry experts have thus openly questioned whether Sanofi's partnership with MannKind (NASDAQ: MNKD) for its inhaled insulin product, Afrezza, is a "sign of desperation". Given the diversity of problems swirling around these two companies, I think the drop in their respective share prices is justified. Moving forward, Glaxo looks, to me, like it has the easier road to recovery. If Glaxo can make progress on the payer front for Breo, I see no reason why this stock won't eventually rebound. Glaxo's management has also reassured investors that it doesn't plan on cutting the dividend in the near future. Sanofi, by contrast, chose perhaps the worst time to fire its dynamic CEO, i.e., only months before losing patent protection for Lantus. The company's unwillingness to shrink its workforce to reduce costs also looks especially problematic. Overall, investors seeking high yields may want to check out Glaxo, but Sanofi falls into the "danger zone" in my book.